I don’t know whether it’s the genes or the food served in the Akhtar household, but genius seems to flow in their blood. Father Javed Akhtar needs no introduction and neither does his step mother Shabana Azmi. They both command respect with their contribution to Indian cinema and culture. Mother Honey Irani is a remarkable across in her own right. Following suit, son Farhan first wowed audiences with his direction in the gen-next flick Dil Chahta Hai and followed it up with Lakshya. As he wasn’t very happy sticking to only direction, he decided to try his hand with acting and even singing in the recent “Rock On” and became the new heartthrob of India. Not to be left behind, sister Zoya slipped into the director’s chair while bro tried yet another cap, that of a producer! So sitting at home, they decided to make this movie “Luck by chance” with sister directing, brother producing and acting & father writing the lyrics (and I’m sure giving Zoya a hand in the script as well). And I’m glad they did. 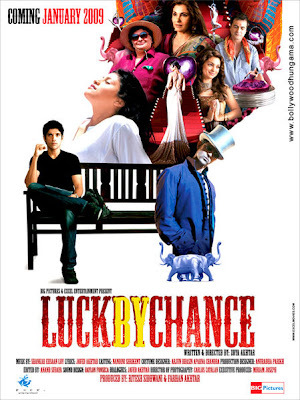 Luck by Chance may be touted by many as yet another take on bollywood – the casting couch, the double faces, the agents, and the hypocrisy. Another Madhur Bhandarkar’s Page 3/ Fashion, you ask?? No. Not even close. The movie doesn’t pretend to be an expose and refrains from being one. The way I see it, it’s a tale of a bunch of people trying to make it big in the Film Industry, at times compromising on themselves and at times justifying this compromise. Everyone knows how difficult it is to act for a living, and this film helps us see that from the point of view of the protagonists. Farhan excels in his acting again. His no-flair and natural style charms you and even helps you sympathize with him when his character shows shades of grey. Konkana has always been one of my favourite actresses and continues her no-nonsense act. She is as believable as you and me and looks gorgeous in the last frame walking through the crowds with her newly found self-confidence. The Akhtar family goes the Om Shanti Om way by bringing in friends to do cameos. Hritik Roshan is hot as ever and does a good play of a pricey hero act. Shahrukh plays himself and shows why he’s still the super hero. BTW, he plays his true self to such an extent that he is seen wearing his wedding ring which he has not in any film till now. Dimple Kapadia plays the yesteryears jaded starlet who is determined to make her daughter shine. But the star of the movie is Rishi Kapoor. He and his wife Juhi play an entertaining couple that know the ways of the world and yet live with the nuances. The 2 have done a great job in this film and leave a smile on your face. The music of the film is also catchy but it doesn’t stick with you. Overall, a thoroughly enjoyable movie and a one time watch. Don’t expect any national awards here. Im waiting to watch it. Will go get it tomorrow. Looking fwd to it! what a perfect review, harnoor! i wonder how many people nooticed Rishi and Juhi's stellar eprformace though?! till date i have heard you, another pal and pati even mention them! Esp Rishi. Jushi Chawla just seems to get better with every movie! awesome. and yes, this movie subtly showed a lot more without pretending to be an expose! like that sham Fashion. hated it! Welcome back Abha....long time!! I completely agree with you...they were the stars!! The Akhtars seem to be great at making entertaining movies!! Did you watch it yet Ras? What's your take?